No matter how you stake it, tomato cages do a lousy job of supporting plants. Several years ago I invested in tomato cages that I thought could stand up to a tomato plant full of nearly ripe fruit. I went out of my way to go to Farm and Fleet because they had an inverted tomato cage. These cages are wider at the base and narrow as they get taller, and come in 3 sizes, up to 60 inches tall. This spring when I planted more tomatoes than I had cages, I returned to Farm and Fleet and bought several more of these sturdy, tall and least-likely-to-tip-over-cages. 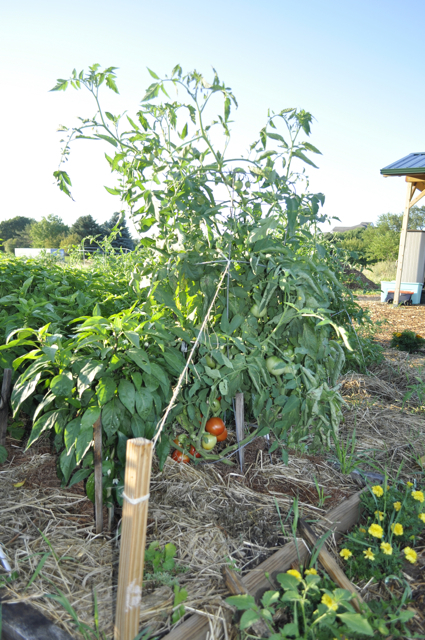 Regardless of the smart design of the wide bases, my heavily–laden tomato plants are still tipping over. I've had to drive extra stakes in my bed to secure the cages. I think I'm done with these crappy cages. Using everything I learned about trellis thing this summer, I'm going to put new trellising into practice next spring. But what to do with the cages? This summer I also found the need to stake my pepper and eggplants, because the heavy fruit tends to break off the rather fragile branches. I'm thinking about supporting these plants with the abandoned tomato cages because overall, peppers and eggplants aren't nearly as heavy as tomato plants. It'll be less work for me staking and tying up the plants, and will probably do a much better job supporting the fruit and branches than stakes and twine. At least I won't have to worry about all the money I invested in these crappy tomato cages. A note about the rest of this series. We are not well past watering tomatoes and pests/diseases. I'll pick this up again next summer when we're actually worried about these things. Happy tomato harvest!